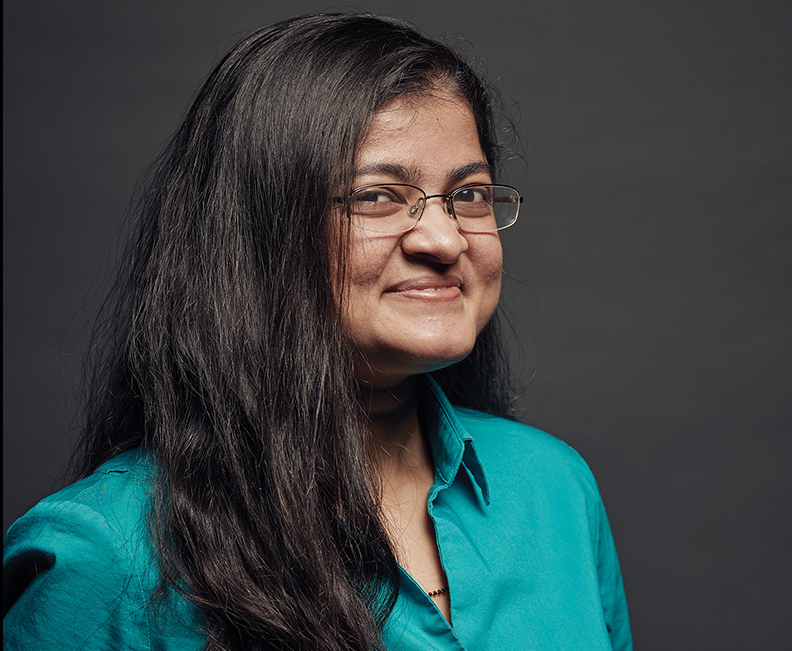 The past few months have been exciting ones for Mansi Kasliwal, a professor at the California Institute of Technology (Caltech). She has spent countless sleepless nights working with a team of astronomers (many of them graduate students and postdocs, which she took the time to acknowledge in her talk) that discovered and analyzed the first electromagnetic (EM) counterpart to a gravitational wave (GW) event, GW170817. Details about the GW event itself were a major component of Gabriela González’s talk on Wednesday. In the plenary talk this morning, Kasliwal focused on what we can take away from its EM counterpart. Kasliwal began by discussing the bright outlook on multi-messenger astronomy — in which we study and coordinate observations between different messenger signals (GW, EM radiation, neutrinos, and cosmic rays). She then gave us an outline of the timeline for the EM detections. A burst of gamma-rays was the first EM counterpart, detected 1.7 seconds after the merger, and after cross-matching galaxy catalogs with the region identified from the two LIGO detectors and VIRGO, infrared telescopes were able to pinpoint the location of the merger. So what does the EM counterpart tell us? As Kasliwal pointed out, when the neutron star-neutron star (NS-NS) merger was first announced, 84 papers appeared on arXiv — and that number has climbed steadily since. For one, the NS merger has given us insight into where r-process elements are formed. People had theorized that perhaps NS-NS mergers or NS-black hole mergers produced many of the elements heavier than hydrogen, but we had never actually seen one of these events before LIGO, let alone been able to take spectra of the remnant, as they have done with GW170817. The spectra give us a wealth of information about what elements are present and were created after the merger, but a full analysis won’t be finished for months or years from. Still, they have shown us that some r-process elements can be formed in this kind of merger. Secondly, the event has also given us new insight into jet physics. While GW170817 was often characterized as a short gamma-ray burst, Kasliwal was careful to refer to it only as a “burst of gamma-rays.” This event hasn’t quite fit the profile of a short, hard-gamma-ray object, in part because its was 10,000 times wimpier than others in this class have been. Our basic picture of an off-axis short, hard gamma-ray burst fails to explain the event and the afterglow, nor does it explain how bright and blue it was for a long time afterwards. It is also what Kasliwal calls “mildly relativistic”, with a Lorentz factor of 2–3 (still ~0.9 the speed of light) instead of 100 (~0.99995 the speed of light! ), as we would normally have seen. Instead, Kasliwal discussed the application of the “cocoon” model to explain this burst. In the cocoon model, the merging neutron stars rip off a few hundredths of a solar mass of material from each other as they spiral in, causing the jet to break out into a messy ejecta and creating a wide angle instead of a narrow, 10-degree beam that we might otherwise have expected. This explains the wimpy burst and the bright blue appearance (due to the accelerated ejecta). Even with all of this new information however, some things — like the ultimate fate of the jet — still remain to be seen. What we can take away from Kasliwal’s talk is that analysis of GW170817 is far from over — there is still much more we can learn from it and other events like it in the bright, multi-messenger astronomy future. Detonation channels for Type Ia supernovae. 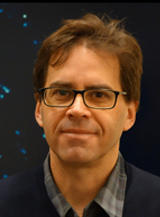 Robert Fisher of the University of Massachusetts at Dartmouth is an expert in complex explosions and uses supercomputers to study how Type Ia supernovae detonate. 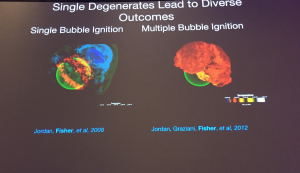 Dr. Fisher tells a story of competing explanations for the thermonuclear explosions of Type Ia supernovae: single-degenerate and double-degenerate pathways. The single-degenerate pathway is the textbook Type Ia supernova: a white dwarf siphons mass off of its main-sequence or red-giant companion until it exceeds the Chandrasekhar mass and explodes. The double-degenerate pathway requires either a degenerate or helium-rich companion. Dr. Fisher commented that both pathways likely exist in nature, but we need a better understanding of the outcomes of each scenario to fully grasp the observed diversity of supernova light curves. Simulations showing that the single-degenerate pathway can lead to a variety of outcomes. 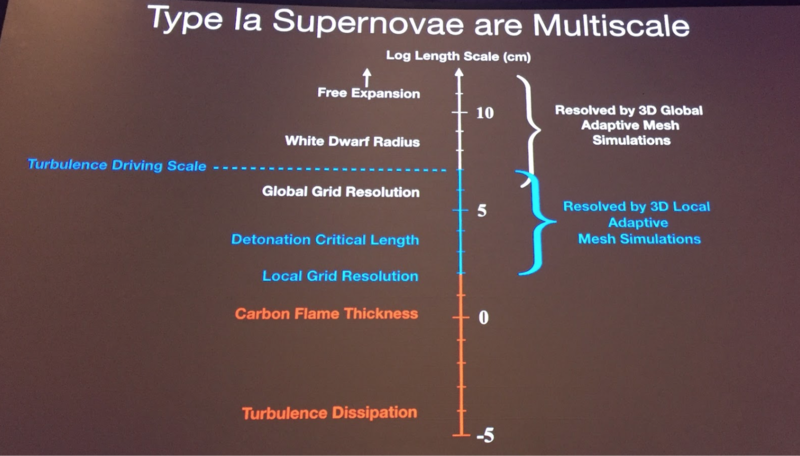 There are many outstanding questions in supernova science: Do all “normal” Ia supernovae detonate the same way, or is it possible to get a typical result through different pathways? What about the atypical (abnormally bright or dim) supernovae — are they just extreme cases or the typical supernovae or do they arise from a different pathway? Most importantly, how can we distinguish between these scenarios? Simulations are an excellent tool for understanding how supernovae detonate and how the resultant light curves will look. 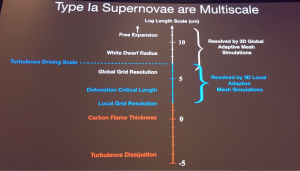 Dr. Fisher outlined the shortcomings and successes of supernova simulations. Simulations have been successful in showing that the single-degenerate pathway produces diverse explosions, but there are theorized detonation methods that still haven’t been modeled, such as the “deflagration to detonation” method. Modeling unusual supernovae like SNR 3C 397, which is asymmetrical, could lead to a better understanding of how Type Ia supernovae explode. The variety of important length scales in supernovae. The recent advances in modeling will help capture the small-scale physics that can have a big effect on the outcome of a supernova. For the double-degenerate channel, current simulations fail to capture small-scale physics like turbulence or the size of the carbon flame. This leads to poor agreement between the modeled and observed light curves, which is an ongoing issue. Advances in supernova modeling will capture turbulence-driven detonation, which should help the modeled light curves match the observations more closely. Observed supernova light curves, when used in tandem with simulations, can also yield information about the origins of the supernova. Looking at the light curves of supernovae well after peak brightness (late-time light curves) can help distinguish between the scenarios. The ratio between iron-55 and cobalt-57, for example, is predicted to be different in the single-degenerate and double-degenerate pathways. 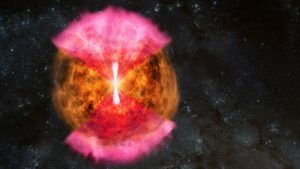 The ratio should be reflected in how quickly the luminosity declines since the different isotopes have different half-lives, providing an observational constraint on supernova detonation mechanisms. David Goldston of MIT got real with the assembled astronomers about their federal budget woes. He explained that what astronomers sometimes fail to do is put things in context; when the budget numbers are released (and science inevitably gets a disappointingly small piece of the pie), scientists can be quick to attach sinister meaning. Not so fast, said Goldston. Interpreting the budget numbers without first considering the context can be misleading. The single largest determining factor for the annual science budget is the total size of the federal budget. While the amount allocated each year to science varies, the percentage of the budget distributed to science has remained nearly the same for decades. While this can seem discouraging — what control do individuals have over the federal budget?! — Goldston thinks that this shows that a major fear of scientists is unfounded; if science’s slice of the pie has remained the same for decades, the insidious threat of anti-science sentiment must not have taken hold as firmly as many scientists fear. (A clear exception to this is climate science, where views tend to fall along political lines, with some lawmakers complaining that climate science is carried out by “politicians in lab coats” and pushing for cuts to funding.) He cited yearly polling that shows that scientists consistently rank first or second on the list of people who act most in the public interest and are highly-respected. Plus, people are attracted to the idea of discovery, of having “Wow!” moments, of learning new things. And luckily for astronomers, the appeal of discovery can override the desire for practicality; when lawmakers attempted to surreptitiously slash funding for Hubble, public outcry saved the beloved telescope. So, what does that mean for scientists? What, if anything, can individuals and organizations like the AAS do to improve budget prospects for science? Goldston reminded the audience that politics begins at home, and small changes can have a big effect. He emphasized the potential impact of higher education institutions and encouraged universities to host government representatives and show them what federal funding pays for — especially the “Gee whiz!” stuff — because they may not know. He added that introducing the representatives to students is especially important, saying, “Education is the most politically attractive aspect of science research.” He shared some advice for conversations with lawmakers: Remember that they’re people — people who are awed and inspired by images from Hubble — but people with a great responsibility that scientists do not have. Connect with them as people and show them that your work is in the public interest — because big changes won’t happen without people committed to bringing them about. 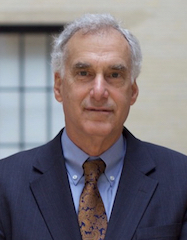 The final plenary talk of AAS 231 was given by MIT professor Peter Fritschel, who received the 2017 Lancelot M. Berkeley Prize. His talk was the instrumentional counterpart to Gabriela González’s Wednesday presentation, focusing on the aspects of the LIGO design that allowed them to make their amazing discoveries. Most of the talk was accompanied by pictures of the various parts of the experiment that was being discussed. LIGO’s basic design can be thought of as an enhanced Michelson interferometer. However the LIGO interferometers have several changes that make them much more powerful than standard Michelson interferometers. To effectively increase the arm length of the interferometer, they add Fabry Perot “cavities” to the arms. Mirrors are placed near the beam splitter to allow the laser light to bounce back and forth 280 times before the light is merged again. For gravitational-wave (GW) experiments, the larger the experiment the better, so this increases LIGO’s effective arm length from 4 km to 1120 km, making it far easier to detect any GW passing through. 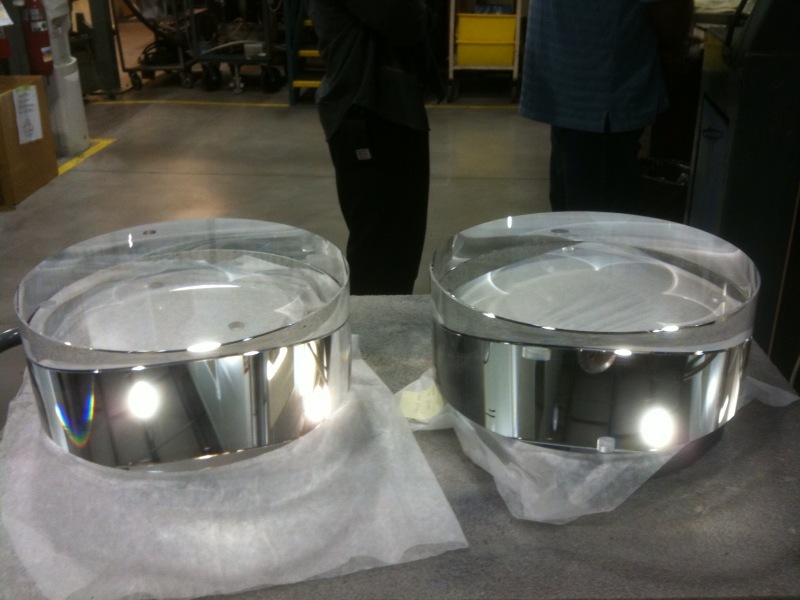 LIGO also uses power-recycling mirrors to build up the power of the laser and is able to boost the power by 3750 times, ultimately generating an output 750 kW beam. This allows the instrument to produce a sharper interference pattern to make it easier to detect any GWs passing through. The LIGO interferometer has four test masses that must be very well isolated from the surrounding environment in order to measure the incredibly tiny distortions from a gravitational wave. They use a combination of both active and passive damping to achieve this. The active damping senses vibrations in the surrounding environment and acts in a way to counteract them. The passive damping holds the test masses still using a four-stage pendulum. 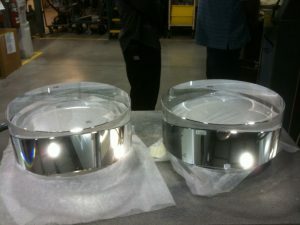 These test masses are 40 kg of fused silica, which they chose to minimize infrared absorption. Since LIGO uses an infrared laser, this is especially important. Astonishingly, only one out of every 3.3 million photons is absorbed by their mirrors. The others are all reflected or transmitted. LIGO is also built in such a way that allows (and anticipates) that it will be upgraded, which includes having space for bigger and newer components. It has already been upgraded several times and they are continuing to increase the sensitivity. By design, it is currently limited by quantum and thermal noise. They plan to decrease the quantum noise by using squeezed light. The thermal noise largely comes from the Brownian motion of the optical coatings, so finding new low-thermal-noise coatings with high reflectivity will help LIGO achieve even better sensitivity in the future. Fritschel concluded his talk by discussing the future of gravitational-wave astronomy as a whole. With Virgo interferometer now online and Kagra and and LIGO India joining in the future, the study of gravitational waves is just getting started.